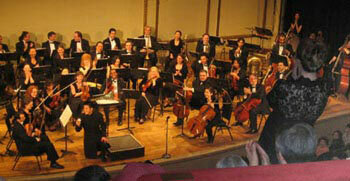 One World Symphony, conducted by Artistic Director Sung Jin Hong, makes its Town Hall debut on March 26, 2006. 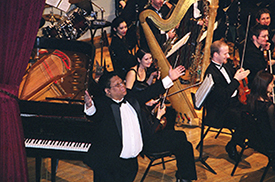 The orchestra, which has been praised for its energy and virtuosity, will perform classics by two of the greatest American composers of the twentieth century, George Gershwin and Leonard Bernstein. Both Gershwin and Bernstein endeavored to adapt classical music to the modern age by incorporating the sounds and images of the urban life. 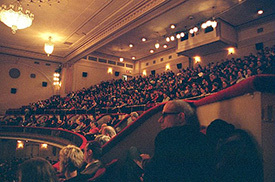 The Town Hall program will include George Gershwin's dizzying An American in Paris (1928) and his timeless Rhapsody in Blue (1924), as well as two selections from Leonard Bernstein's West Side Story (1957). 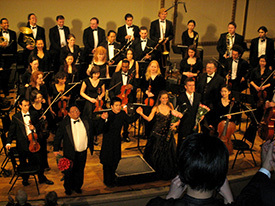 Gershwin and Bernstein had great success in making classical music both relevant and rewarding for modern audiences, and, for five years, One World Symphony has built on this tradition with its talented musicians, thought-provoking programming, and infectious enthusiasm.